This is a beautiful slinky jacket, available in roomy sizes 0x to 8x. 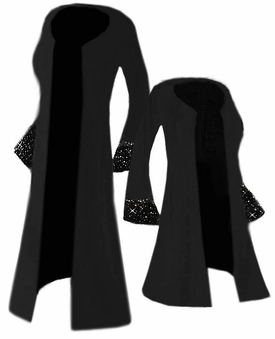 It is a gorgeous black stretchy material with scattered rhinestone detail on the bell sleeves. It is an open jacket, with no buttons or closure; it is meant to be worn open. Very pretty! The picture doesn't do it justice! Machine-washable; nylon/ottoman slinky; made in USA.